On Thursday [July 26] the Youth Movement for Employment held a press conference at which this movement announced its creation. The president of the movement, Mr. Balle Diagne spoke about the causes behind the creation of the movement and reviewed its objectives which aim, among other things, the recovery of young people exposed to a potential rupture with society and to fight at their side against drug abuses, narcotics, criminal gangs, as well as extremist currents etc. To this end, the movement aims to create a space for exchanges and functional learning between state and non-state institutions, to popularize national unity and cohesion and to challenge decision-makers and economic operators to invest in promoting of youth development and raising awareness of the values ​​of citizenship and the culture of peace. In this context, the president of the movement stressed the importance for young people to preserve national assets and to promote development projects for young people. As for the secretary general of the movement, Mrs. Malika Mint Mohamed Saleck, she reaffirmed the same principles and objectives inviting all young Mauritanians to join the movement that aims to develop Mauritania and protect against all dangers. 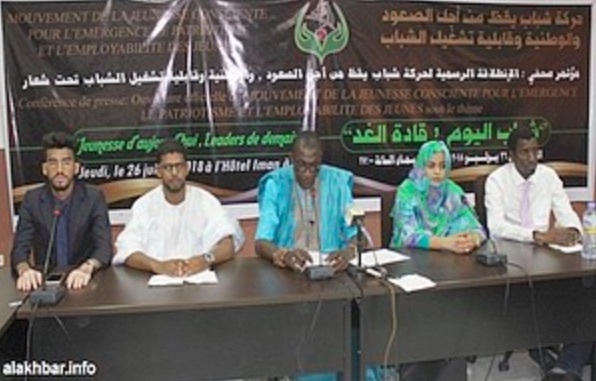 Responding to a question from the Mauritanian Information Agency on the nature of the movement, Balle Diagne said the movement is not political, but he called on Mauritanian youth to register on the electoral roll and to participate fully in the elections. He added that his movement does not operate within the framework of tribal and regional sectarian structures but, on the contrary, strongly opposes them. He said he believes in the skills and abilities of young Mauritanians.